Bill posted a really great resource: Flash Lite market percentage (as of January 2008). Those numbers are from U.S and Western Europe and give quite good impression of the target market in those selected regions. 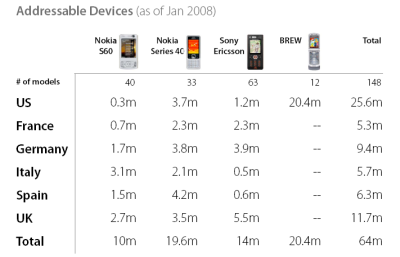 Listed numbers include Nokia S60, Nokia Series 40, Sony Ericsson and BREW. It’s especially great to see the numbers of devices separately for each platform as well. I always thought UK had the most S60 devices in Europe, however it’s clear that Italy is the leader.